GENERAL: General Ewell has been ordered to take the offensive upon Centreville. You will follow the movement at once by attacking him in your front. On account of the difficulties in our front it is thought preferable to countermand the advance of the right wing. Resume your former position. The general says this is the only order he has received. It implies he is to receive another. Send this to General Beauregard if. you think proper. 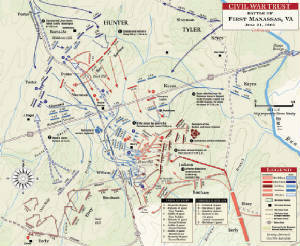 Shortly after this I was requested by General Longstreet to make a demonstration in his favor on my front, followed by an order from General Beauregard, borne by Mr. Terry, 11.30 a.m., to advance upon the enemy Up Rocky Run, co-operating with General Ewell on my right and General Longstreet on my left. I recrossed the ford, my men much fatigued by the morning's march, many just convalescing from the measles, and retraced my route to the position I had occupied in the morning, and thence endeavored to communicate with General Ewell. Failing in this, I notified General Longstreet that I was advancing to the assault, and proceeded westwardly through the woods to the eastern elevation of Rocky Run Valley. My regiments were pushed forward by a flank movement through a ravine in the northeastern corner of Croson's field, with instructions to form into line after crossing the hollow in the following order, viz: Colonel Jenkins, Fifth Regiment South Carolina Volunteers, on the right, his right wing resting on the woods; Colonel Burr, Eighteenth Regiment Mississippi Volunteers, on the left, and Colonel Featherston, Seventeenth Regiment Mississippi Volunteers, supporting my artillery, protected by a company of infantry and Captain Flood's small troop of cavalry, to be posted on the brow of a hill well to the left--the only point from which it could be used at all--in order to distract the enemy's fire from my advancing lines of infantry. This arrangement of my two pieces of artillery, I regret to state, was impracticable by a vigorous converging fire from the enemy's rifled guns and an advance of his infantry before my infantry company could be thrown forward to protect the pieces, and I was compelled to withdraw them. Colonel Jenkins' regiment advanced through a galling fire and over exceedingly difficult ground across the hollow. The Mississippi regiment followed, but owing to the great difficulties of the ground, which were not apparent in my reconnaissance, and to the murderous shower of the shot, shell, and canister which was poured upon the brigade from a masked battery, as well as from that in front, faltered, and, with the exception of Captain Fontaine's company, fell back. I rallied them in the woods to the rear at a point to which I had previously withdrawn the artillery and cavalry. While the Eighteenth Mississippi Regiment was endeavoring to form into line its right became lapped behind the left of the Fifth, upon which its fire told with fatal effect. 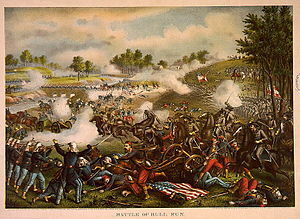 The latter regiment (the Fifth), notwithstanding the heavy fire of the enemy in front and the unfortunate fire of friends in the rear, advanced to the opposite slope, and then formed into line of battle, prepared to make the charge. Being isolated by the falling back of the supporting regiments it maintained its position for nearly three-quarters of an hour, its two right companies in the mean time thrown into the woods with well-directed volleys, driving the already retreating foe precipitately from the field. After I had dispatched three separate orders to withdraw, there being no favoring demonstration from Blackburn's Ford, it retired well formed and in good order from the field. Although the main object of our attack--the possession of the battery--was not attained, the effect of our operations, I am glad to believe, was none the less important in working out the grand issues of the day. The enemy left in panic the strong position from which he completely commanded several fords of Bull Run and the adjacent country for miles around. My men behaved well in making the advance, considering the great difficulties of the ground and the terrible nature of the fire, as the following statement will show: Fifth Regiment South Carolina Volunteers, 3 killed, 23 wounded; Seventeenth Regiment Mississippi Volunteers, 2 killed, 10 wounded, Eighteenth Regiment Mississippi Volunteers, 9 killed, 29 wounded. Total, 14 killed, 62 wounded. It affords me much pleasure to express the confidence with which the conduct of Captain Miller and Lieutenant Norcom, of the artillery, and Capt. J. W. Flood, of the cavalry, attached to my command, inspired me. I only regret that the circumstances of my position pre vented me from deriving the full benefit of the assistance they were so ready and eager to give. Too much cannot be said in praise of the gallantry displayed by Colonel Jenkins and his regiment of South Carolinians. The daring advance in line, the unwavering determination and coolness with which he held his command in position after it was completely isolated, and the ready tact with which he advanced his right flank and scattered the foe, will challenge comparison, I venture to say, with any of the many exhibitions of gallantry that graced the signal victory of the day. To Captain Fontaine, Company H, Eighteenth Regiment Mississippi Volunteers, much praise is also due for the manner in which he kept his company in hand. Not only did he resist the backward pressure of the other companies of his regiment, but he gallantly maintained his ground in rear of the Fifth Regiment, and with it retired from the field. For more detailed reports I beg leave to refer you to the accompanying reports of colonels commanding regiments of this brigade. To the following-named gentlemen: Lieut. F. G. Latham, acting assistant adjutant-general, Capts. A. Coward, J. W. Ford, E. Taylor, J. R. Curell, and Lieut. O. K. McLemore, members of my staff, I am indebted for valuable assistance, and I am under especial obligations to Mr. E. W. Kincheloe, whose services as messenger, scout, and guide were truly valuable to me personally, as well as the cause in which we are engaged. I take pleasure also in acknowledging the valuable assistance of Colonel White and Mr. Davis, both independent volunteers, accompanying the Mississippi Volunteers under my command.